We like classic Peter Pan story, every year we can see new releases and productions which take the story to a new level with some modern updates. Peter Pan is always favorite among kids and adults, where even evil characters are an honor to play for children during playdates. On fall we had a chance to see the show The Peter Starcatcher at Shaw Festival at Niagara-on-the-Lake and, recently, we were excited to see new Warner Bros. movie PAN. The film which coming out on December 22, just on time for holidays to enjoy favorite story. It takes us to London during Second World War when the city is continuously under attack and sirens sounds become usual part of everyone’s life. Peter, played by Levi Miller, a mischievous 12-year-old boy with rebellious attitude who lives in the bleak orphanage and where he has lived his whole life. Then one incredible night, Peter is taken away from the orphanage and spirited off to a fantastical world of pirates, warriors and fairies called Neverland. There, he finds amazing adventures and fights life-or-death battles while trying to uncover the secret of his mother, who left him at the orphanage so long ago, and his rightful place in this magical land. For kids and adults who work every day as miners to get fairy pixie dust for evil pirate Blackbeard, Neverland was not that magical, even James Hook lost hope to change anything there. Until rebellious Peter Pan shows that he can not only stand for himself but also fly like a bird. Great skills never left without attention, so when Blackbeard (Hugh Jackman) decides to get rid of Pan, he teams up with the warrior Tiger Lily (Rooney Mara) and a new friend Hook (Garrett Hedlund) to defeat the ruthless Blackbeard to save Neverland and discover his true destiny—to become the hero who will forever be known as Peter Pan. 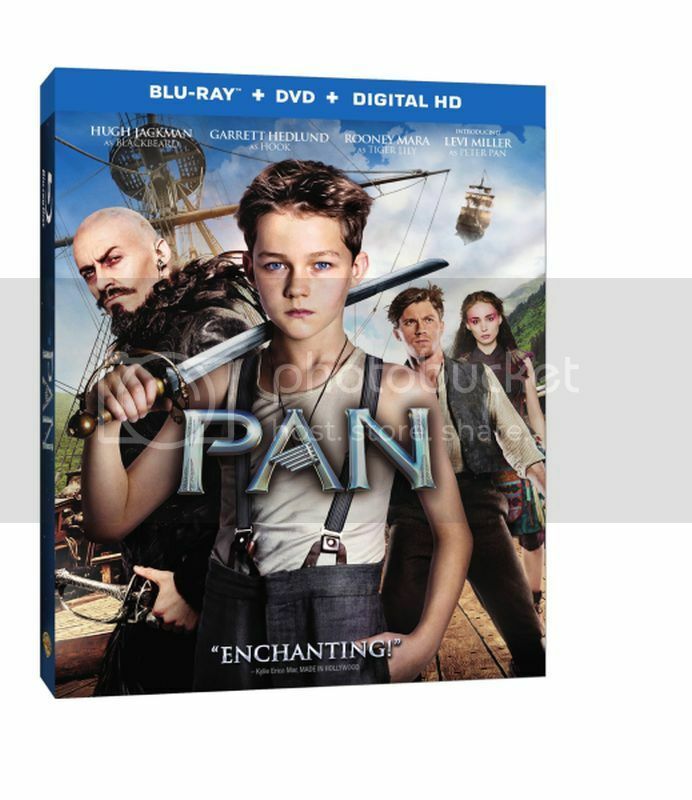 The movie is fascinating with huge flying ships of Neverland, and even more spectacular battles. There are lots of moments which catch your attention and magical episodes when you feel like you flow along the river. Just to say when Tiger Lily is telling the story about Peter Pan’s mom and dad using a barrel or the story Pan is told in the river. It was strange to see that James Hook and Peter Pan are not rivals, but Hook got the title Captain at the end. Teddy said that Captain Hook was good in the movie, why? Though he thinks, that Hook is not very bad character to hate but still. We had a good time watching the movie, the plot was very simple and easy to follow. There were some sad moments about Pan’s parents but overall kids loved it. The film is available on Blu-ray 3D Combo Pack, Blu-ray Combo Pack and DVD on December 22.